Brad, what a GREAT Story that is about your step son. Also thank you for posting the pictures for me too. In the top and lower photos (above) we have "Pre-Probie" members of the Bendick family, this sites administrators. Center photo is "Pre-Probie" Firefighter Gary H., who told me he wants to be on a big ladder truck like the one near his house. Brad, so glad your son won the battle. God Bless him and your family. Great news about your son. Continued thoughts and prayers. 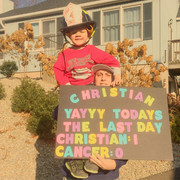 Keep on riding Christian ! 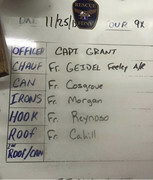 Congratulations to John T. B. from John T. K.
"THEMAJESTIRIUM1", aka Joseph Ramos, I just finished watching the "Blessing of Jersey City's Rescue 1" that you posted on this site in the "National Section". I greatly appreciate the work you do in recording and posting the many videos you provide. Also, I am one of your many 47,000 subscribers to "THEMAJESTIRIUM1" You Tube Channel. So whether its the FDNY, NYPD, FDNY/EMS, or any other such organization within the Metro NYC area, "we thank you for what you do". And here is "THEMAJESTIRIUM1" being interviewed by a news channel. Thank you Joe for your terrific work! THANK YOU ONCE AGAIN, "THEMAJESTIRIUM1", aka Joseph Ramos, for the AMAZING WORK YOU DO. Whether it is a fire in New York City or New Jersey. Whether it be the NYPD or FDNY/EMS, a police or fire department outside of NYC, or a private ambulance service doing their job, WE THANK YOU ONCE AGAIN. Personally, I have no idea how you do it. You are there when it happens. Then you take the time to post that video on here for all of us to see who couldn't be there. This morning as I was thinking about telling the members of you EXCEPTIONAL WORK, I decided to go on your own Youtube channel. Honestly, I gave up trying to count how many videos there are. There are dozens and dozens of them. What a GREAT JOB. We are very lucky to have you with us on this site. I guess in my own opinion, I kind of compare you to my good friend, "mikeindabronx', aka Mike D. As most of us know, Mike did a GREAT JOB in photographing the FDNY during the 1980s. Long before any cell phones with video capability was thought of. A time when taking such photos required a special skill as well as special equipment to do it. Mike's photos, just as your videos, are an amazing piece of work. And just like Mike was out there on those cold winter nights and hot summer days, you too are out there adding your stories to the history books. So Joe, just as I did this morning, I will post the link to your dozens of videos for others to see as well. And for Mike's, aka "mikeindabronx", we will provide his link as well. GREAT JOB DONE and Glad you both are a part of this site. 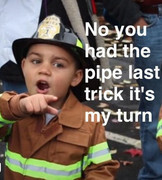 John "T" has begun his training for the FDNY/EMS. There is a total of 185 Probie Trainees going through these classes of which they are broken down into two groups, day shifts and evening shifts. John "T" is part of the evening shift probie school classes. I think the FDNY/EMS will do very well with Probie John "T" working within the largest EMS system in the country. I'm sure Retired FDNY Capt Grandpa John "jbendick" and FDNY Uncle Lt Tommy B "tbendick" are very proud of him. I wish John "T", as well as the other 184 FDNY/EMS Probies all the best in their future careers with the Life Savors known as the FDNY/EMS. Thanks to ALL of the current FDNY/EMS members for the GREAT JOB they do in saving and helping the hundreds of lives in New York City on a daily basis. You really are "Our Guardian Angels". Here is a sample of what John "T" might expect. A very Special Happy Birthday To Raybrag aka Ray B.
Ray has been a member since 2007 & a great contributor to this fine page.